Home | Serigraphs and Giclee Fine Art | Liudmila Kondakova Parisian Art | Liudmila Kondakova Signed And Numbered Limited Edition Serigraph:"Hotel De La Seine "
Liudmila Kondakova Signed And Numbered Limited Edition Serigraph:"Hotel De La Seine "
Image size: 27 " x 36 "
About the Print:"Just beyond Sacre Coeur, a small intimate cafe rests atop the hill in Montmartre. The cracked plaster walls of the aged buildings are bathed in a rich golden light. In the wee morning hours it seems nearly possible to see the ghosts of Picasso, Van Gogh, Cezanne and Utrillo. As they walk among the shadows, their whispers fill the silent street." 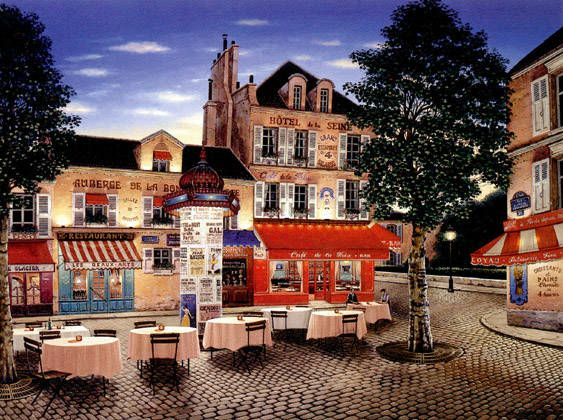 - Liudmila Kondakova Rich in detail and color, Liudmila Kondakova's serigraph, Hotel de la Seine, is an image set in the village square of Montmartre, an area of Paris replete with history and romance. Long ago visited by Picasso, Cezanne and Van Gogh, this village square is by day filled with artists and easels, and by night with outdoor tables set by local cafes in hopes of luring visitors drawn by the local artists. Through Hotel de la Seine, Kondakova's rendering appears almost photographic in it's lavish detail. Through her palette and perspective, the artist's imagery conveys a deep sense of intimacy. It is twilight in Paris. The street lamps glow brightly, and the flames of the candles that sit on the outdoor tables dance in the summer breeze. The aged posters that decorate the village kiosk beautifully advertise local happenings. And the storefronts, so boldly colored, tempt passersby with their wonderful aromas of baked goods and candy. Liudmila Kondakova conveys her love of cities, in particular of Paris, through her execution of the imagery in Hotel de la Seine. Each cobblestone is painstakingly rendered, the folds in each tablecloth thought through by the artist and intensely detailed. The artist's intent is to lure the viewer into her art, much in the way the cafe owners wish to entice hungry visitors to their outdoor cafes depicted here. That Kondakova surrounds her colors and emotions in such vivid detail and history conveys her love of her subject matter, and that she does it with such gentleness and charm speaks to her love of her craft. Home | Fine Art Prints & Limited Editions | Gallery Direct Art is your Authorized Chalk & Vermilion Dealer | Liudmila Kondakova Parisian Art | Liudmila Kondakova Signed And Numbered Limited Edition Serigraph:"Hotel De La Seine "